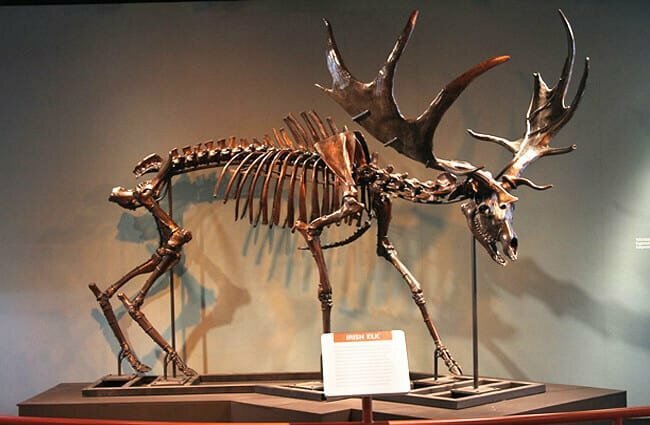 Irish elk are extinct members of the Cervidae family that died off about 7,700 years ago. It was one of the largest deer species to ever walk the earth. Their primary defining characteristic was their enormous antlers, which dwarfed those of modern-day deer, elk, and moose. Despite their name, Irish elk did not exclusively live in Ireland, nor were elk their closest relatives. 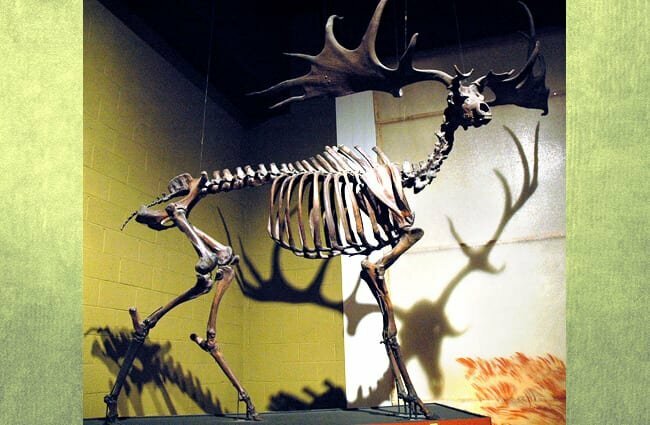 Read on to learn about the Irish elk. Though no one alive today has ever seen one in the flesh, the fossilized remains of this species give us a good estimation of what they looked like. They stood about 7 ft. tall at the shoulder, and their antlers were 12 ft. across. To carry such heavy antlers, it is likely they were incredibly muscular, particularly in their necks, chests, and backs. Scientists estimate that they weighed about as much as some modern-day moose, up to 1,500 lbs. Because they had the largest antlers of any deer, these elk have captivated us humans for centuries. While we don’t know everything there is to know about these mysterious creatures, we do know a few fun facts! 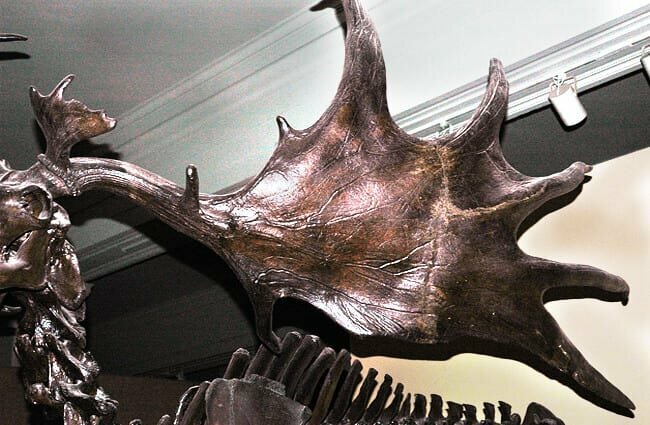 “Irish” Elk – We know now that Ireland is not the only place that these massive cervids roamed, so why do we still call them Irish elk? 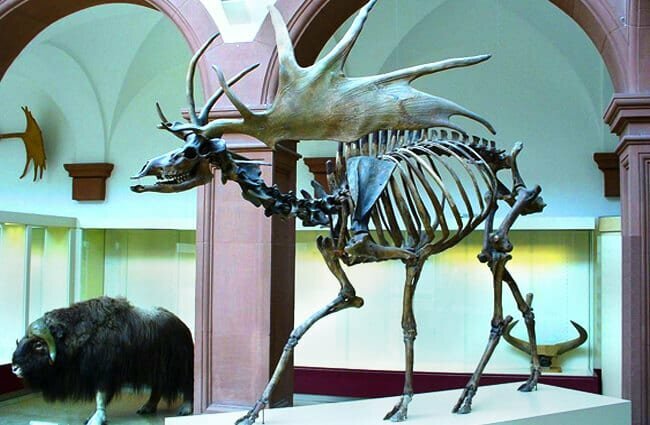 Paleontologists have found multiple remains of well-preserved Irish elk throughout peat bogs and lakes in Ireland. This is not the only place they are finding fossils, but the name stuck! Wide Ranging – Outside of Ireland, these massive elk also lived in other parts of Europe, northern Africa, and much of Asia. Because of this, they are present in the folklore and art of quite a few different regions. Awesome Antlers – This deer had the largest antlers of any other deer species. Their massive antlers measured 12 ft. across and weighed up to 80 lbs. or more! Their antlers were palmate, or palm-shaped, like modern-day moose. However, the tines, or points, of the antlers were longer than those of moose. 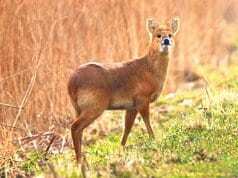 Scientists believe that this species lived in open grasslands. Logistically speaking, walking through forests with 12 ft. antlers would have been a nightmare. They likely required lots of vegetation to maintain their immense body size as well. 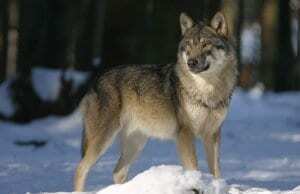 As with any extinct animal, researchers can only speculate the exact details of this animal’s needs. Because they are extinct, scientists cannot say with certainty everywhere that these deer lived. Fossilization requires specific types of conditions, so it is likely that these deer lived in other areas and specimens simply decayed as usual, instead of undergoing preservation. Researchers believe that they lived throughout much of Europe, northern Asia, and northern Africa. They lived in many of the same areas that ancient humans did. There is simply no way to know for sure what these giant elk ate while they lived. 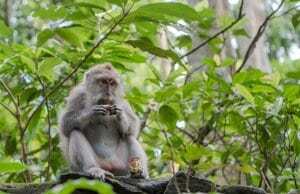 Scientists can only speculate their diet based on similar animals and the habitats they lived in. Like most other members of the Cervidae family, you can assume these elk were herbivores. 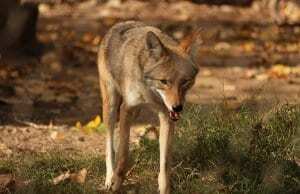 They likely ate grasses, leaves, stems, shrubs, herbs, fruits, and any other similar vegetation. Because these giant deer lived at the same time as humans, for at least the end of their rein, researchers assume that humans hunted them. 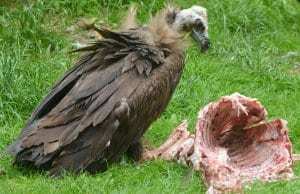 However, they are unsure whether hunting contributed to the extinction of this species. 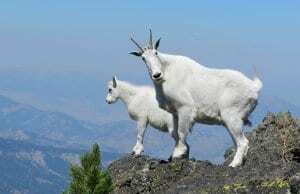 Various scientists differ in opinion, but most agree that the decline of optimal habitat after the previous Ice Age, as well as added pressure from hunting, ended this species. 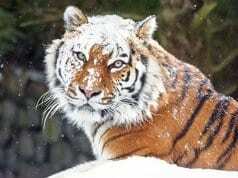 Like the disappearance of many other species, this serves as a powerful cautionary tale, as humans continue to destroy habitats, and hunt some species to extinction. 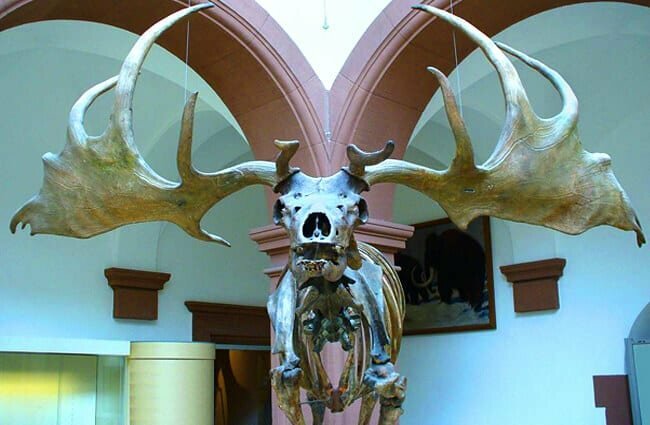 Humans never domesticated Irish elk. 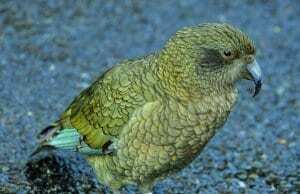 This species is extinct, so it is impossible to own one as a pet. However, even if they were alive, keeping an animal with 12 ft. antlers as a pet would be inadvisable. It definitely couldn’t be a house pet, in fact, it couldn’t even fit through your front door! This elk species is extinct, so researchers do not know what type of care they would need in a zoological setting. 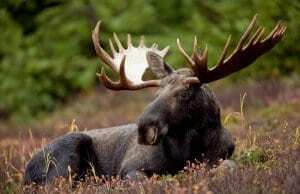 We can assume that this species, because it is quite similar in size and shape to moose, would need similar care. As far as their diet, behavior, and breeding habitats, we simply cannot know what is optimal. As with any extinct animal (that is not recently extinct) some things simply remain a mystery. While there is no concrete proof, scientists believe that these elk used their giant antlers to battle one another for breeding rights. As with other species of deer, these elk likely lived in herds. Males probably used their massive antlers to fight for dominance and the right to breed with females. In addition, they likely used their enormous antlers to defend themselves and their herds from predators. 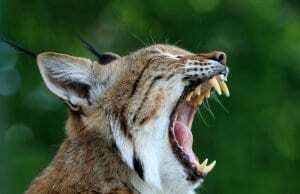 Scientists can glean very little reproductive behavior from fossilized or preserved remains of animals. There is simply no way to know what type of gestation length or weaning age these animals experienced. 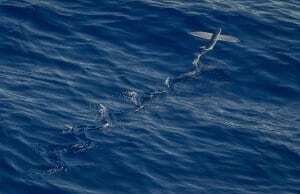 However, scientists can use fossils to study grouping behavior if enough fossils are present. 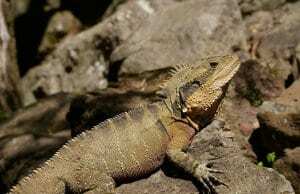 Because of this, they believe it is likely that this species fought for the right to breed with females, and males mated with more than one female.